Huygens Wind Biedermeier Vienna Regulator FOR SALE. Exceptional and Rare Biedermeier style, Viennese regulator with "Huygens Wind" system and beautiful "Engine Turned" bezel. Beautiful circa 1850 Biedermeier Vienna regulator in Rosewood case. This Vienna regulator is of classic design and proportions with a beautifully detailed tail. The single train movement is provided with jeweled end caps on the anchor, dead beat escapement, and beat regulation. 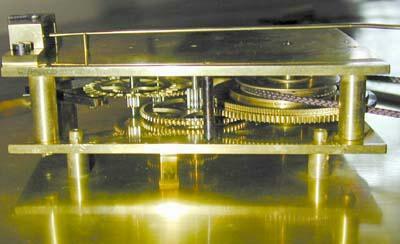 This has the very rare "Huygens" winding system. Pulling down onthe small weight raises the large weight. It runs a week on a winding. The clock is approximately 40" long . It is 12" wide at it's widest. The dial is nearly perfect. The pendulum stick is made from wood. The pendulum bob is lead filled and very heavy. The front and back of thebob are both brass. The glass is old wavy glass. Caveats: The veneer on the door has been redone by the best restoration guy I know of. It is finished properly with many hand laid coats of shellac, as it would have been done originally. This is not unusual considering it's 140 year life. Also, the crown and tail piece are later but proper additions. The dial is a later, but proper, replacement. This clock has had a rough life, but it has been properly restored.